Persons with Libra Moons and Ascendants often display the pleasant and well proportioned facial characteristics of their Suns, as the breezy and balanced force of Cardinal Air keeps there mannerisms markedly serene. Notably, since VENUS rules Taurus as well as Libra, all persons with a strongly aspected Venus often have a gift for displaying the calming beauty of Libra and/or the enticing sensuality of Taurus. 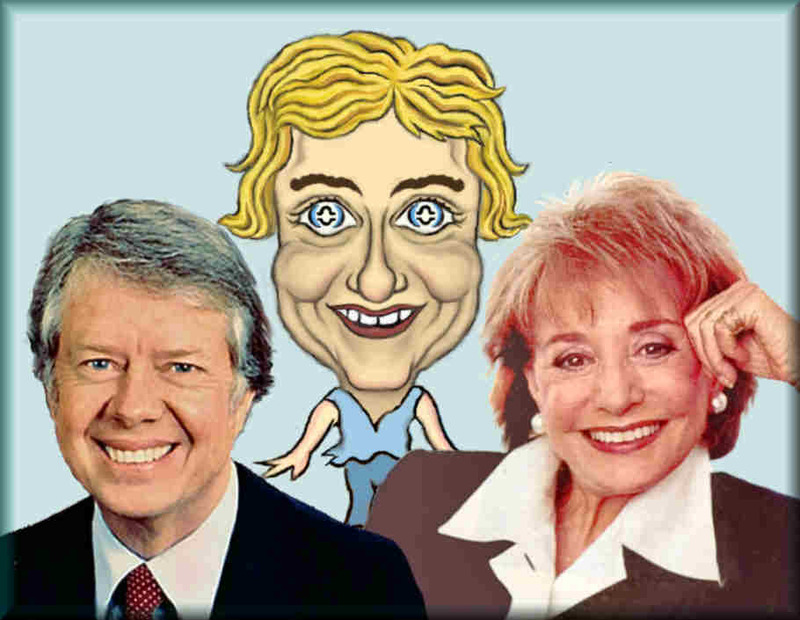 The light and expansive energy of air is seen in the expressions of Jimmy Carter and Barbara Walters. They also display many of the physical characteristics of Libra—most noticeably, the wide smile with the “V-shaped” chin lines that sweep up and out—to create those cherubic cheeks and dimples. Just like Jimmy and Barbara, most Libras have the sparkling almond-shaped eyes, that align in perfect horizontal balance. Watch how they dart from side to side, as the hands spread out from the midsection to teeter from one side to the other. You will see these “weighing gestures”, when Libra tries to disarm all arguments by taking both sides. This facial collage displays the cardinal air qualities of six Libra celebrities; It also shows how their different astrological components alter their dispositions, personalities and the facial characteristics–those traits we’d expect in a person with a Libra Sun. Need a little balance in your life? We suggest you share some time with a Libra friend. Hugh Jackman and Gwyneth Paltrow show us the pleasant physical traits of Libra, as well as versatility and mental agility of their Gemini Moons. Gwyneth’s Ascendant is Pisces, the same as Bruno Mars. However, Bruno is the classiest showman of the lot. His Moon is in Leo! With his Aquarius Ascendant, Matt Damon also shows the breezy qualities of air. However, his emotions also seem to be controlled, serious and cautious. His Moon is in Capricorn. This tenacity and persistence is even more obvious in the mannerisms of Susan Sarrandon. Her Moon and Ascendant are in the cardinal Earth of Capricorn. Sigourney Weaver appears to be the least flighty in this group, for she eludes a powerful and calm resilience. Weaver’s Moon and Ascendant are in the fixed Earth of Taurus–all three are ruled by the planet Venus. As you’d expect, her Venus is in Scorpio! This may be why she seems to get stronger when she is encountered by threatening forces–like we saw in her Alien films. Many of the key physical traits of Libra are demonstrated in these photos. What becomes apparent (other than the smile) is that our subject’s facial elements are well proportioned and in symmetry. All lines seem to be aligned in horizontal balance. The exceptions are Jackman and Paltrow, who have strong mutable components in their charts.